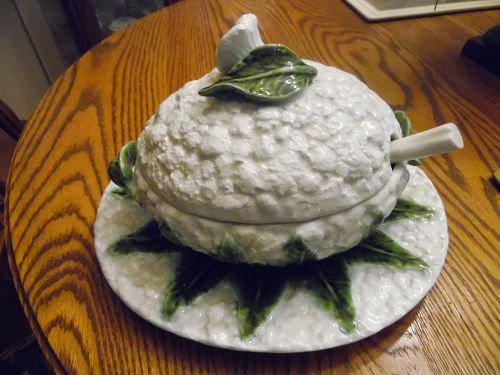 Rare Cauliflower tureen with matching underplate. It is in nice condition with typical crazing,no chips, cracks. (I am throwing in the ladle, that has been repaired, at no cost, it is good for display) . The tureen and underplate are great though. The plate and Tureen is signed with an impressed mark. The oval plate is almost 11 1/2 inches across, it does have some utensil scratches in the center of the plate.. The tureen is about 8 inches across excluding the handles and about 6 inches high to the top of the floret finial.This is a nice collectible to add to your kitchen vegetable serving pieces.